Friday April 18th – May 18th, 2014. April 18 – May 18th, 2014. Opening Reception Friday April 18th 6-9. Park Life Gallery is proud to present Crash, a new series of collages from Hilary Pecis. 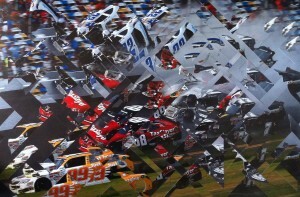 For Crash Hilary Pecis presents a series of collages composed of large scale photos of high profile NASCSAR crash scenes that were cut up and reassembled in order to present a reinterpretation of the events. The reference scenes are familiar and widely circulated in digital form, and were chosen for their spectacular formal qualities. Pecis provides enough information for the viewer to decipher the image, but information is intentionally left out and/or multiplied. Pecis further scrambles the borrowed digital images by cutting and pasting them into a surrogate image. 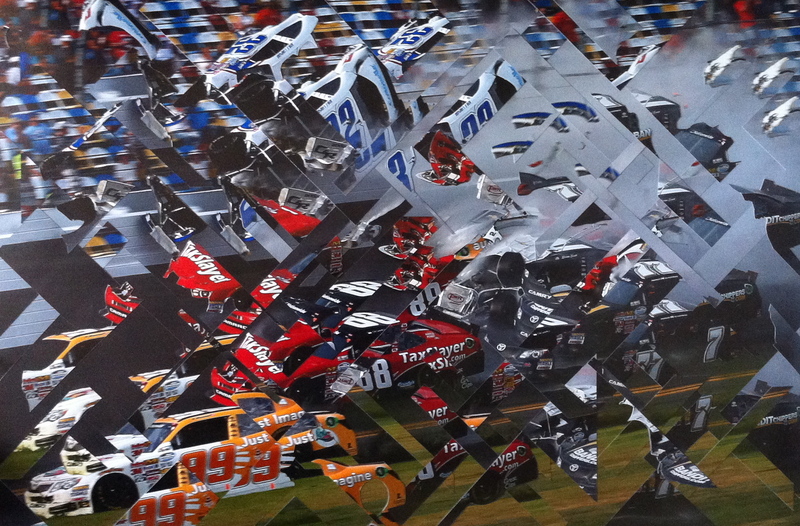 The use of crash scenes is for the most part formal, however the mangling of the vehicles that occur in the image is further manipulated with the rearrangement of the collage. The artist furthers the drama of the scenes that can appear both exciting and familiar. The images portrayed also echo the rearrangement of the physical object and metamorphosis into something else, at times resembling a more organic arrangement.